Data-Driven Attribution is different from any other attribution model because it’s not rule-based. While rule-based attribution models give credit to touchpoints depending on their position within the conversion path, Data-Driven Attribution looks at historical data and assigns more credit to the touchpoints that had the greatest impact within the conversion path. Whether leveraging Data-Attribution in AdWords or looking at Google Analytics’ cross-channel funnels, this model will continually analyze the customer journey of every user (converters and non-converters) and assign values to each touchpoint depending on the impact within every journey. For example, if there’s one campaign/channel that drives a conversion every time a customer is “touched” through it, Data-Driven will assign more credit to it than it would to other campaigns/channels that do not drive as many conversions. Data-Driven helps brands understand the multi-channel funnel in a more efficient way by providing cross-channel performance-based data. 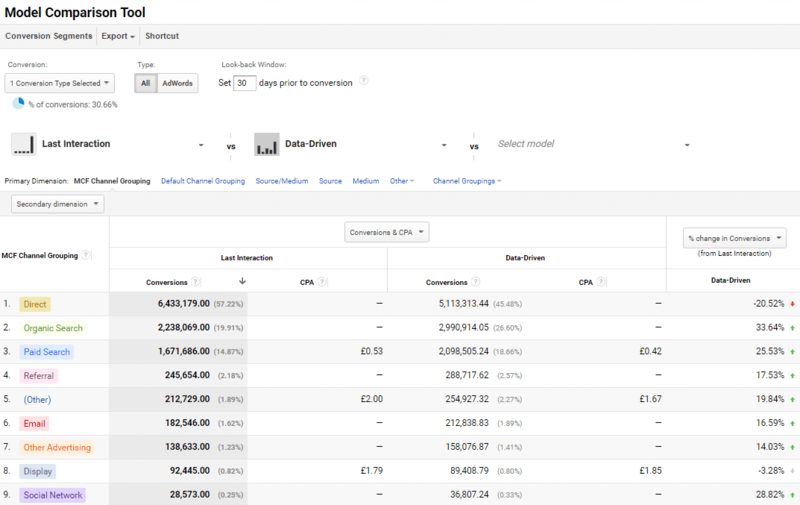 This data will allow marketers to allocate their budget and efforts into the most efficient channels. If a business only advertises in Search, AdWords will provide it with this same data at the campaign level to optimize towards the campaigns and keywords that perform better. How do I compare my current Attribution Model to Data-Driven? To learn more about attribution models, contact Performics today.